For the month of my birthday, I’ve bought an embarrassingly small amount of beauty product for a blogger. Great for my wallet, but the wishlist is growing. 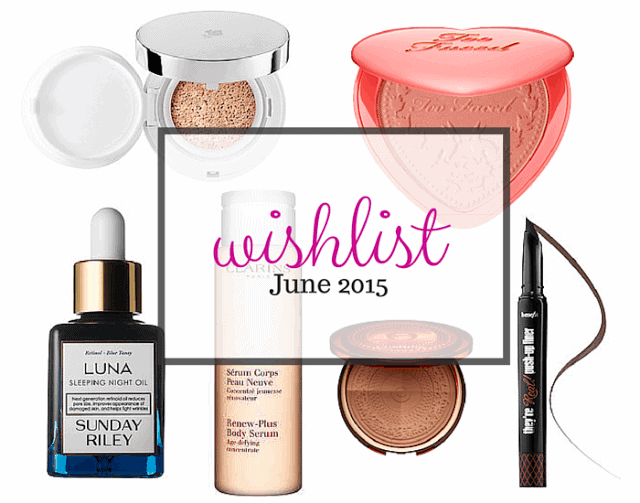 Here are six products that have piqued my interest this month! 1. Lancome Miracle Cushion Compact Foundation is supposed to leave a dewy finish, in a hydrating formula that supposedly cools on contact! Nifty. I love the idea of how compact this is, and when I swatched it in store it had such a thin lightweight formula that built up nicely. 3. Another slightly pricey want here (clearly June is the month of champagne tastes on a beer budget!) is the Clarins Renew-Plus Body Serum. I’ve heard can do wonders for Keratosis Pilaris, a skin condition that I’ve had since I was a kid, and has only gotten worse with age. Apparently it eliminates dead skin cells and ups moisture levels. I’ve tried just about everything for my KP, so I am beyond curious about this one! 4. I’m a blush fanatic, so it’s no surprise that the Too Faced Love Flush Long Lasting 16 Hour Blush caught my eye. Besides the super adorable colour-matched packaging, the formula claims to be long lasting with super buttery pigment that bonds to your skin. I’ve got my eye on the shade Love hangover! 6. Finally something that didn’t initially wow me over, but is now coming in new shades, is the Benefit They’re Real Push Up Liner in Beyond Brown. I actually liked the product in the original very much, but the applicator was a bit of a faff for me. I have however been on the hunt for a great long lasting brown gel liner, and can always dispense onto the back of the hand and apply like a brush. What’s on your wishlist lately? have you tried any of the products on mine, and if so please share your thoughts in the comments below!